The CCDrawNode class in CocosSharp provides multiple methods for drawing common geometric shapes. It inherits from the CCNode class, and is usually added to CCLayer instances. This guide covers how to use CCDrawNode instances to perform custom rendering. It also provides a comprehensive list of available draw functions with screen shots and code examples. All draw methods require at least one position value for drawing. This position value is relative to the CCDrawNode instance. This means that the CCDrawNode itself has a position, and all draw calls made on the CCDrawNode also take one or more position values. To help understand how these values combine, let’s look at a few examples. In this case, the CCDrawNode is positioned at (100,100), and the drawn circle is at (0,0) relative to the CCDrawNode, resulting in the circle being centered 100 pixels up and to the right of the bottom-left corner of the game screen. The code above results in the circle’s center at 50 units (drawNode.PositionX + the CCPoint.X) to the right of the left side of the screen, and 60 (drawNode.PositionY + the CCPoint.Y) units above the bottom of the screen. Once a draw method has been called, the drawn object cannot be modified unless the CCDrawNode.Clear method is called, so any repositioning needs to be done on the CCDrawNode itself. Objects drawn by CCNodes are also impacted by the CCNode instance’s Rotation and Scale properties. Draw methods need to be called only once to create a persistent visual. In the example above, the call to DrawCircle in the constructor of the GameLayer – DrawCircle does not need to be called every-frame to re-draw the circle when the screen refreshes. This differs from draw methods in MonoGame, which typically will render something to the screen for only one frame, and which must be called every-frame. If draw methods are called every frame then objects will eventually accumulate inside the calling CCDrawNode instance, resulting in a drop in framerate as more objects are drawn. 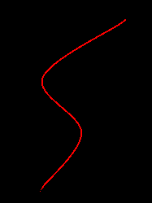 DrawCardinalSpline creates a curved line through a variable number of points. The config parameter defines which points the spline will pass through. The example below shows a spline which passes through four points. The tension parameter controls how sharp or round the points on the spline appear. A tension value of 0 will result in a curved spline, and a tension value of 1 will result in a spline drawn by straight lines and hard edges. Although splines are curved lines, CocosSharp draws splines with straight lines. The segments parameter controls how many segments to use to draw the spline. A larger number results in a smoothly curved spline at the cost of performance. DrawCatmullRom creates a curved line through a variable number of points, similar to DrawCardinalLine. This method does not include a tension parameter. DrawCircle creates a perimeter of a circle of a given radius. DrawCubicBezier draws a curved line between two points, using control points to set the path between the two points. DrawEllipse creates the outline of an ellipse, which is often referred to as an oval (although the two are not geometrically identical). 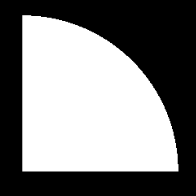 The shape of the ellipse can be defined by a CCRect instance. DrawLine connects to points with a line of a given width. This method is similar to DrawSegment, except it creates flat endpoints as opposed to round endpoints. DrawLineList creates multiple lines by connecting each pair of points specified by a CCV3F_C4B array. The CCV3F_C4B struct contains values for position and color. The verts parameter should always contain an even number of points, as each line is defined by two points. DrawPolygon creates a filled-in polygon with an outline of variable width and color. DrawQuadBezier connects two points with a line. It behaves similarly to DrawCubicBezier but only supports a single control point. DrawRect creates a filled-in rectangle with an outline of variable width and color. DrawSegment connects two points with a line of variable width and color. It is similar to DrawLine, except it creates round endpoints rather than flat endpoints. DrawSolidArc creates a filled-in wedge of a given color and radius. DrawCircle creates a filled-in circle of a given radius. DrawTriangleList creates a list of triangles. Each triangle is defined by three CCV3F_C4B instances in an array. The number of vertices in the array passed to the verts parameter must be a multiple of three. Note that the only information contained in CCV3F_C4B is the position of the verts and their color – the DrawTriangleList method does not support drawing triangles with textures. This guide explains how to create a CCDrawNode and perform primitive-based rendering. It provides an example of each of the draw calls.